The only thing wrong with the debut album from Happyness is that you have to go to NME.com to stream it. I would recommend buying it when it's out, 16.06.14 on Weird Smiling. Lofi synths, intimate vocals, simple guitars and no nonsense drums might sound like absolutely everything at the moment, but whatever is in the magic touch of Happyness makes Weird Little Birthday unique and infinitely loveable. The record is vaguely conceptual, telling the age-old tale of a boy that shares his birthday with Jesus Christ and is driven so mad with jealousy that he kills people. The story is loosely told within finely tuned, slacker rock drawling vocals, with double tracked weirdness setting the tone for the album with opener, 'Baby, Jesus (Jelly Boy)'. The title is a reference to (other than the story, obviously) the band's own Jelly Boy Studios, where the majority of the album was recorded. After the vocal introduction, the bass lines come rolling in like rays of fret noise and sunshine, where they remain for the duration; allowing the guitars to dance around in the slightly psychedelic haze of feedback. There are hints of early Weezer and Pavement throughout, delivered in Happyness' own unsettling, genre-bending style. A perfect example of this is lead single, 'Great Minds Think Alike, All Brains Taste The Same'; it's catchy, twee and completely addictive. Approach with caution though, Weird Little Birthday is an album of contrasts - the ups and the downs juxtaposed without grating on each other, but possibly grating on some listeners. From the jangling ups of 'Great Minds Think Alike, All Brains Taste The Same', we're dropped down into the Eels-influenced lows of 'Orange Luz' and its cocktail of the simplest of drums and droning synths/ organ. That is, of course, until we're catapulted up again by one minute and eighteen seconds of fuzzed out guitars and distorted vocals in 'Refrigerate Her'. This pattern continues through the dark, wonderful and unsettlingly tuneful 'Pumpkin Noir' and into the explosion of 'Anything I Do Is Alright'. Although this song is on the heavier end of their spectrum, the vocals and touches of keys still break through the fuzz, betraying their roots. The lyrics are surreal, tongue-in-cheek and intentionally bizarre, but there are nuggets of pure poetry in there as well. In fact, the two most understated stars of this record are the lyrics, delivered amongst gently persuasive melodies, and the album-wide schizophrenia of the guitars. Guitars that stroke easy listening chords and soothing progressions one second, while tearing through fuzz and feedback the next; the band recognise the importance of space and it's the guitars and vocals that create the album's subtext-heavy Summer breeze feel. By half way through the birthday party you will have stopped noticing the songs zig zagging between one and eight minutes in length. 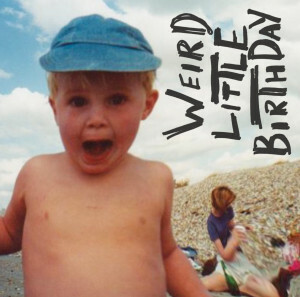 As the (sort of) title song 'Weird Little Birthday Girl' washes over you, whispering its secrets, you're hypnotised. 'It's On You' still has some of their adolescent charm, but with a maturity and perspective that all the college rock influences in America couldn't mask. From the turning point of the story (the point where our protagonist cracks), second single 'Leave The Party', things get low. The incredible next song, 'Lofts' is beautiful in its own unexpected and relentless way, and somehow hopeful in it's despondence, before 'Monkey In The City' wraps things up with resonating organ speakers and a pleasant anti-climax, backing out quietly to no applause.